Kathi’s Secretarial Services is your local expert when it comes to professional transcription and secretarial services. We have specialized in the field of transcription services, data entry and word processing for more than 20 years, and we are proud to continue to help customers in Carlsbad, CA and the surrounding areas. At Kathi’s Secretarial Services, we are genuinely committed to providing the highest quality transcriptions in Carlsbad, CA. We are more than happy to fulfill all of your secretarial needs including filling orders for transcriptions, word processing, data entry, dictation, typist work, fax services, transcribing services, form filing and much, much more. Whether you have a large court case that needs to be typed or you need a more simplistic document transferred from dictation to the written word, we are here to help. 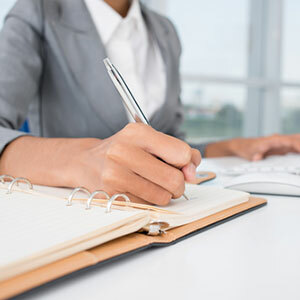 We have been assisting customers in Carlsbad with their secretarial needs since 1995, and we are proud to continue to provide the same level of expert service today. We can provide any of a large number of transcription services in Carlsbad, CA. We work closely with you during the documentation process to ensure accuracy. We have been in business for decades, with the experience and knowledge to show for it. Kathi’s Secretarial Services is owned and operated by Kathi Menard, a mother of two beautiful daughters and a wife for over 30 years. Kathi and her family have resided in Carlsbad, CA since 1984. Kathi graduated from Hartford Secretarial School in 1978, after completing the two-year course in just one year. She was a legal secretary for 20 years. After the birth of her second daughter, she started Kathi’s Secretarial Services in 1995. Kathi’s Secretarial Services offers in-office support to small business and individuals alike, providing direct and convenient services. Fees are charged by the hour, portal-to-portal.